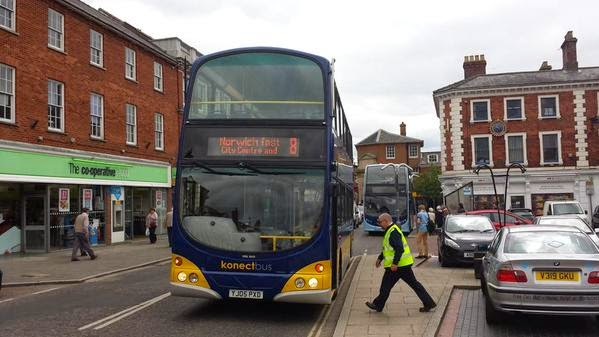 New Buses For Norwich And The Grey Line Is Here! 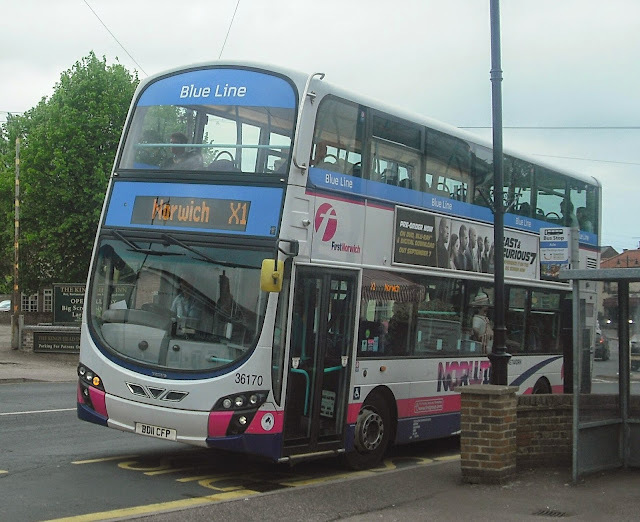 On April 1st I posted a spoof report claiming that some of Ipswich's B7rle's were comng to Norwich to form the Grey Line. Well look what Dan Whiting spotted in Norwich earlier today!! The Grey Line cometh! I must emphasise that contrary to other reports Yarmouth Bus Page was the first to break ths news and it is thanks to Cameron that I have received the information. 66977 is a permanent transfer to Norwich after Ipswich had a spare vehicle going, and the front is to be repainted over the weekend so the bus can enter service early next week. Many thanks, Cameron for alerting me to this. UPDATE: I am informed by Cameron that 66977 is to be Purple Line branded complete with purple front.Thanks buddy. This ties in nicely with the other main news I have today, and news that you see here first. Today saw First Group announce their 2015 bus order, and quite impressive it is too. In total 385 new vehicles are on order, which comprises of 20 Volvo B5LH double deckers, 183 Wright Streetlites, 65 Wright Streetdecks, 63 AD E200 MMC's and 54 AD E400 MMC's. Now what is coming to Eastern Counties I hear you ask. Well I can tell you that Norwich are to receive 8 Streetdecks for the Pink Line. 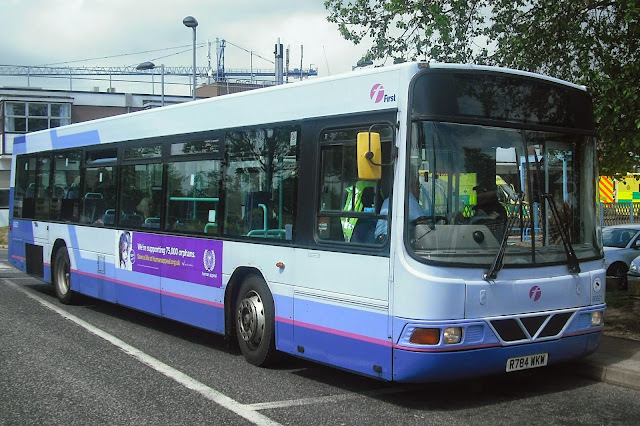 They will come with pink fronts and replace the current Plaxton Presidents on the 11/11A. 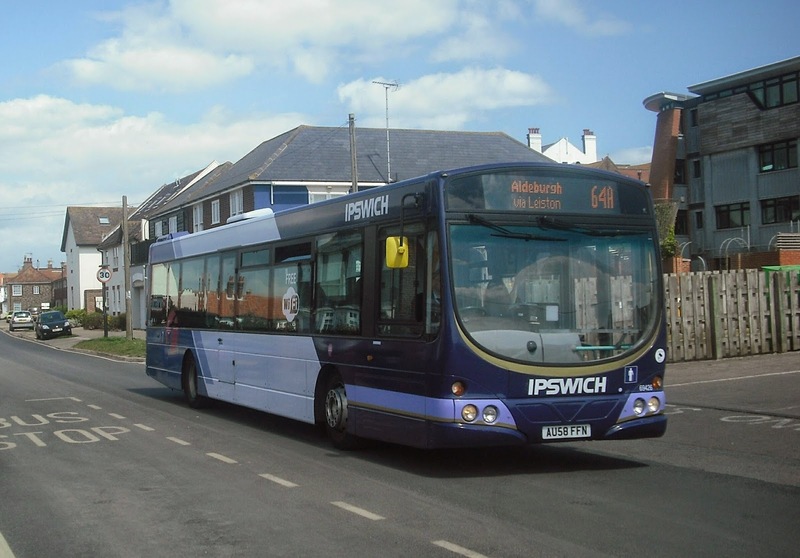 Other newer but not brand new deckers will be cascaded into Norwich to supplement the Streetdecks, in a national cascading programme. Numbers of newer vehicles heading our way and what type are yet to be confirmed, but I suggest it could be another interestng year ahead. Also the Blue Line Gemini 2's are about to start their repaint programme, with 36180 being the first to go, with Chris Speed telling me that "most" will have a blue front. Many thanks for your help today, Chris with your prompt response to my queries. 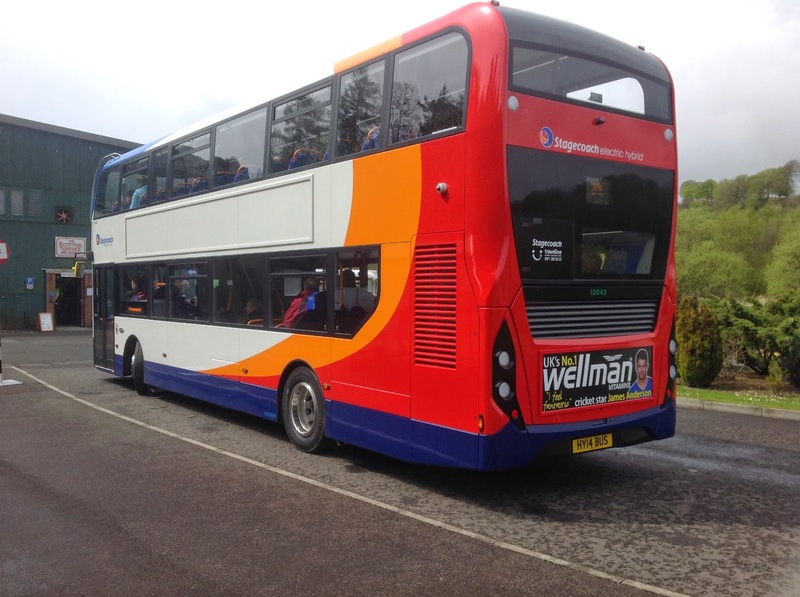 I was delighted to receive two emails over the last week from North of the border, telling me about 18 new buses for Stagecoach Strathtay. 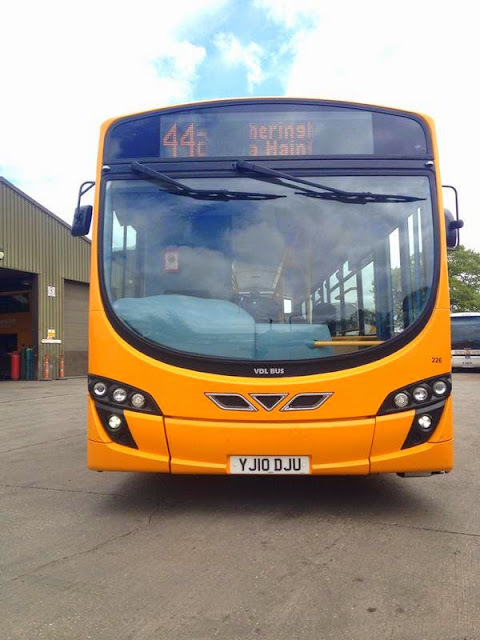 They are Volvo B5LH hybrids with ADL E400 MMC bodies. This is the first collaboration between Volvo and ADL for Stageciach since the Alexander bodied Olympians in 1999. It will be very interested to see how the MMC body and B5 chasis go together. I have a feeling it could be the best combination yet for ADL. Now you may be wondering why these hybrids are not in the normal Stagecoach green livery normally applied to hybrids, with only the front giving an indication of its hybrid feature. 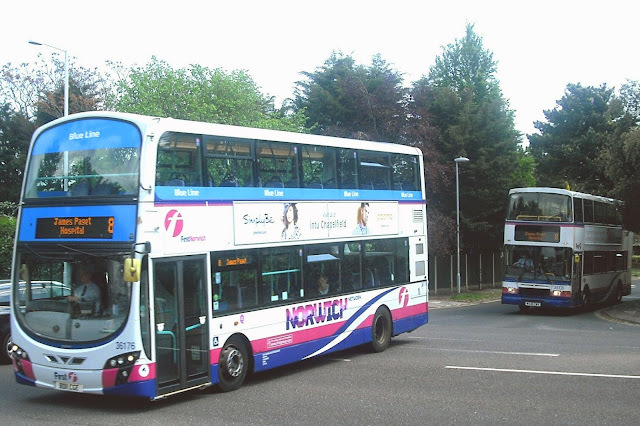 Paul Hawkins tells me that is because National Express Dundee also have E400 hybrids, and as you can see below they also have a green livery. Now a bit about the route the B5 MMC's are on. They are allocated to the 73/A/B running between Dundee and Arbroath, which according to Stagecoach MD Andrew Jarvis has a bit of everything. He says in todays Bus and Coach Buyer "The route is an unusual mix of a dense urban service with steep hills, some city centre running where air quality is key and then on to suburban housing with some interurban running at the route’s very end" Not all services cover the whole route, but it is high frequency, with a 10 minute service on weekdays, 15 min on Saturdays and 20 min on Sundays. The full route takes 87 mins but there is one feature the 73 has that very, very few routes have these days - it is CONDUCTOR operated! I have to say not the first area I'd have thought of for crew operated services! Once again my thanks to Fife Busnews and Paul Hawkins for their pics, and darn it I can feel another trip to Scotland looming! It is quite possible that today was the most exciting and varied day Yarmouth is going to see this years. Thanks to the shenanigans going on in Norwich over the weekend, which saw a few kids wanting to listen to some music, and a group of blokes kicking a ball around in London yesterday there were a lot of displaced vehicles around. Because of their extra top speed it was decided to use Yarmouth Geminis on the footy runs yesterday so 5 of Norwich's Gemini 2's were swapped on Friday. Today all were still in action in Yarmouth - 2 on the X1, 2 on the 1/1A and 1 on the 8's, which also had Olympian 34108 on until early afternoon. 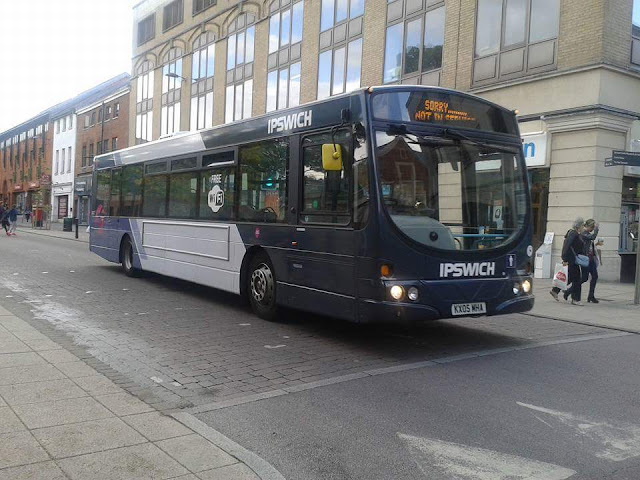 I joined Cameron Robinson and Jamie Glasspoole in trying out the Norwich Geminis on faster routes than they are normally used to. First up was 36176 on the 8 to James Paget. Except we only travelled on it to Gorleston as a new arrival at Yarmouth crept up behind us, which we decided to catch to JPH instead to give us a better photo opportunity of the Gemini. 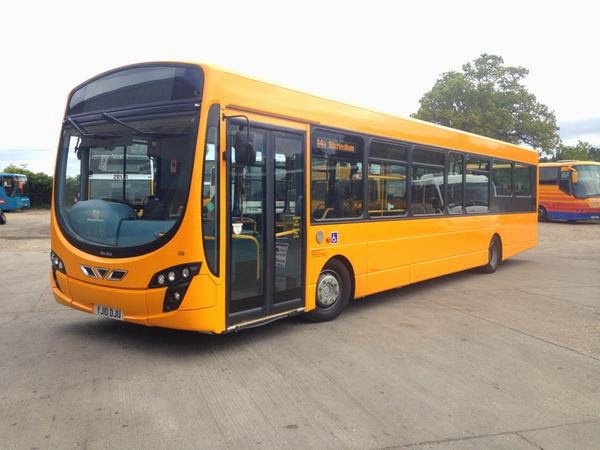 Yarmouth have got another First Yorkshire Volvo B10B Wright Renown on loan, 60621, and so that had to be added to the list. Although my photo didn't capture the destination screen, it was on the 1 to Lowestoft. With that out of the way we got in position to capture the Gemini and got one helluva a bonus when 37176 and Olympian 34108 arrived at JPH at the same time. It is probably the only time these two vehcles will ever be seen together on the same route so for the three of us who witnessed it our pics will become ones for the folder marked "unique"! Now it shouold be remembered at this point that those Gemini2's are ploughing up and down the 25/26 between Norwich Station and University of East Anglia 24 hours a day 7 days a week. They are the most worked buses hours wise in Eastern Counties, and having ridden the 25 a couple of times I know just how many speed bumps they have to deal with too. They are now 4 years old and I have to say have coped outstandingly well. Very few rattles - even on the notorious Gorleston High St, and I really was pleasantly surprised. Praise should also go to the Norwich maintainance team who have kept them is such good order. How nice to praise a bus for once! We caught 36179 back to Yarmouth, which was on the 1 to Martham. After a spot of lunch, to try a longer run and a bit of speed we caught 36170 to Acle on the X1. Once again the Gemini passed with flying colours and it seems a bit of a shame they are restricted to City work so much. Excellent vehicles, well maintained, and can they be loaned out a bit more please! By this evening at least 2 of the 5 Geminis, including 36170 above had returned to Norwiich, with the others set to return tomorrow. Who knows if this will ever happen again. I hope so, but today proved to me just how superior the Geminis are to anything else. Thanks to Cameron and Jamie for their companty today. Look out tomorrow for a new chasis for E400 bodies..
Just a quick post to say congratulations to Norwich City for winning promotion to the premiership at Wembley today. Of course many fans wanted to go and I understand some 170 coaches were organised to transport the fans to London. I'm grateful to First Supremo David Squire, who is clearly a passionate Canaries supporter for sending me the following pics of four of the supporters vehicles leaving County Hall this morning. Many thanks, David and hope the hangover isn't too bad tomorrow! I expect there will be many more pics published elsewhere of this busy weekend in Norwich - the rest of the year is going to seem pretty tame now! It has been interesting though to see vehicles doing things outside the norm. On Monday, before heading up to Scotland I went in entirely the opposite direction and went to Brighton to try out Brighton & Hove's new Wright Streetdecks. It wasn't good weather to say the least. High winds and driving rain greeted me and it felt more like January than May. However I made my way down to the City Centre (caught a bus) and very soon found myself on one of the new Streetdecks heading for Newhaven. First impressions were good. The Streetdecks are comfortable, smooth, far, far quieter than the E400's with no noisy air chill system to bang your head on either. Acceleration is impressive and the braking nothing like as rough as the Streetlites. It also didn't rattle. It wasn't the sort of day to hang around for long, plus I had a booked train back to London to catch, so after half hour in Newhaven I caught another Streetdeck back to Brighton, and it was on this journey a few doubts started to spring up. The trouble is I can't put my finger on exactly what those doubts are. As I mentioned it was a rough day, and on the way back along the coast road from Seaford to Brighton we were getting blown all over the place. Yes it was windy but not exceptionally windy, and I started thinking of the Acle Straight and how the Streetdecks would cope in the wind there. I reached the conclusion they probably wouldn't cope that well, and this really sums up my fears. I just don't think the Streetdecks are rugged enough to challenge for the major routes up and down the country. Obviously time will tell and I'll be going back down there in 6 months or so to see what they are like then. They may prove me wrong - I hope they do but I'm not confident. I asked the driver what the general impression was and he said not good. The cab is cramped and he noticed they didn't handle wind well. And so I jumped back on the fast train to East Croydon, where after a fine tea I caught the 109 to Brixton. The 109's are operated by 64 reg E400 MMC's, and I was eager to sample one in service to see if I thought it better than the demonstrator I caught in Bury a few weeks ago. The answer was apparent very soon - yes I did! In fact despite the noisier air chill I soon preferred it over the Streetdeck. It was in the middle of the evening peak and the bus was full. However it never got hot, there was not a rattle in evidence, again decent acceleration on the rare occasion the driver could utilise it, and being a hybrid the electric motor was quiet and the transition to diesel engine seamless. The seats were comfortable and at last I think Alexander Dennis might have a decent product. Again I'll try them again in 6 months to see how they are lastng but I deliberately chose the route with the 64 reg MMC's which have been on the road a bit as opposed to the new 15 reg ones on the 415. Unfortunately Brixton was heaving when I got there and pics were hard to get and this is the only one I managed. So I have to say the conclusions are rather inconclusive, and further study is required. I'm not bowled over by the Streetdecks although apart from the flimsy feel about them there was nothing really to criticise. The MMC on the other hand I really liked, and I'll be definitely going on them again soon as my latest eye operation is coming up and I'll have to go through Croydon a fair bit in the coming weeks. A decent Chinese buffet and MMC's will make it worth stopping off there! 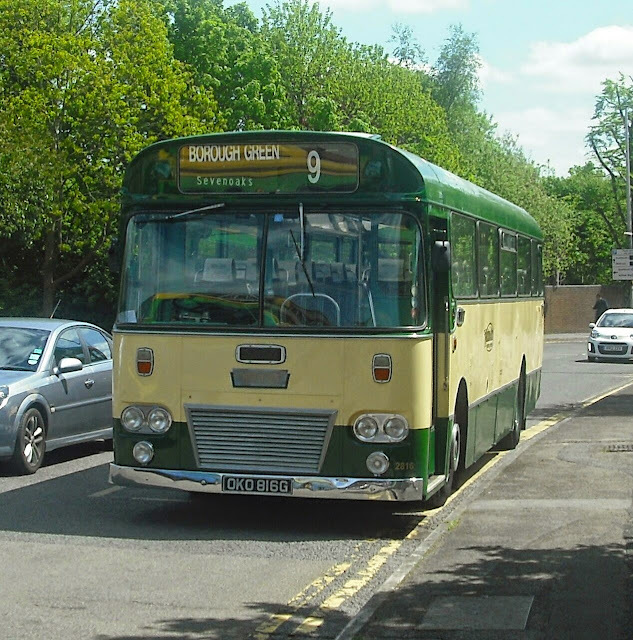 Back from my short break and back to business with Part Three of the Running Day that took place in Sevenoaks last Sunday, in conjunction with an Open Day at Go-Coach's depot at Otford. I've been saving the best till last, a bus that is truly unique in this country, a Chinese built King Long. So a few things about this rather good looking bus that was brought over here from Malta, yes a Chinese bus was working in Malta, in 2012. It is fitted with a Cummins engine, and a fully manual 6 speed gearbox, although the position of the gears are opposite to normal - ie 2,4 and 6 are up and 1,3 and 5 are down. It has seats from the top deck of a Euro 3 Trident from South London that had the bottom deck destroyed by fire, with a moquette that looks rather similar to First's! It goes out in service on the 401 between Sevenoaks and Westerham every day, and unlike the only other Chinese buses I have been on - those terrible BYD electric buses in London, this is an absolute joy to travel on and like someone else's cute puppy I wanted to take it home with me! Now if you read Part One you will know that another pretty unique vehicle was in attendance - Nu-Venture's ex Norfolk Green Agoraline 897. The opportunity to get those two rarities together for a pic was too good to miss, and so thanks to Chris Jenkinson, the Agoraline's Head Keeper, it was possible to get the following pic. Could be a collector's item this one in years to come. Also in Part One I mentioned I'd also travelled on a Routemastwr there. Also belonging to Go Coach this RM also made a few trips to Sevenoaks and back during the day. Of course a ride on a Routemaster is always good, but with this one the soundtrack is all wrong. It has a Dennis Dart engine and that just doesn't sound right. It's like a Formula 1 car sounding like a steam engine. I understand this isn't unique and there are many RM's with Dart engines around, but I have to say I don't like it. When this magnificent beast was built Darts weren't dreamed of in the wildest nightmares and certainly in my view are not a marriage made in heaven. Anyway that is a minor quibble in what was a truly wonderful day in Kent. My thanks to Matt for inviting and taking me there, and to Austin at Go-Coach for the excellently organised Open Day. I have a feeling there may be more to come from this company in the future - if only so I can ride the King Long again! Chris Jenkinson has been in touch to inform me that Agoraline 891 is now fixed and back on the road. Chris has kindly sent a pic which I'm happy to post. Thanks, Chris and see you soon buddy. Welcome to Part Two of my report from the Running Day at Sevenoaks, combined with an open day at Go Coach in Otford. If you missed Part One you can see it here. I promised that in this part we would go all Maltese and Chinese and so we shall. 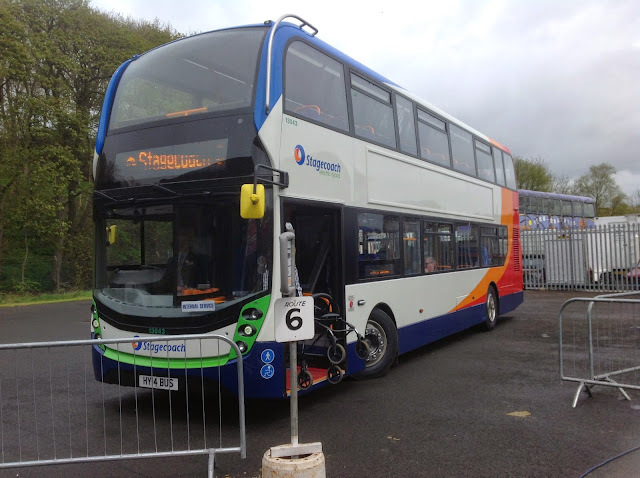 I first saw this remarkable bus at Detling a couple of years ago and today I got up close and personal with it. It is quite simply a mongrel - a Maltese mongrel if you will, which started life in 1943 as a Bedford QL British Army radio truck. Today roughly 3ft of the original chassis survives. The rest has been cobbled together from other bits and pieces. It was converted to a bus in the 1960's and rebodied in 2008 by Zinnu in Malta. It was brought over here in 2009 and has been lovingly looked after ever since. The engine and gearbox come from a Leyland 420 truck, and the steering has also been replaced giving it power steering. But aside from that it is one of those quirky vehicles that you can't help falling for. The cab area is quite unique. There is no door, which makes for great air conditioning (there is a door that has been made to slot in during the colder months but certainly not original), and it is the only bus I know where you can actually sit in front of the driver. Just one problem with that - if you do sit on the bench seat at the front nearside the driver can't see his nearside wing mirror. Not a problem in Malta it seems but in our ridiculous "can't run over cyclists" culture nearside vision is a bit more important! The drivers area, complete with religious posters, cash tray and other Maltese towels etc. It isn't the quietest bus on 6 wheels, however there isn't a rattle on it and a ride on it just brings a smile to your face. Matt told me that wherever it goes it is the most popular attraction and I can see why - brings back memories of holidays and completely different to anything normally seen in this country. Now some other bits of it. The rear bumper and probably the front bumper, as well as the front indicators all come from a Mark 1 Transit, and if you glance at the second picture again you will make out the tiniest windscreen wiper in existance - only offside too. You can just make it out in the above pic. They love this little bus at Go Coach, and it is very seldom a driver asks for his picture taken in front of the bus. Matt did just that, and of course I was all too happy to oblige. To conclude this part another couple of buses which were in attendance. First here is an Optare bodied Volkswagon minibus, which was owned by Roundabout Buses, who operated a number of routes, all minibus plus some little Darts, in Orpington, Bromley and St Mary Cary, prefixed with an R, in the late 80's early 90's. I believe the company was absorbed into Metrobus, though don't quote me on that one. I drove a couple of these VW's for another company and they were toally gutless, with the engine far too small for the job. There was also a Borismaster from Arriva in attendance, which spent all day up on ramps in the garage. The light wasn't great in there, so luckily I was still around when it left the garage to go back to Brixton. Not sure when the next time a Borismaster will be seen leaving Go Coach's garage, so this may well prove to be a one off. In Part Three we'll finally have that Chinese, and the Routemaster with a disappointing soundtrack! As a postscript I heard today of a company that sacked a driver for verbally abusing an enthusiast taking a picture. I won't name the company, but well done. It is good to see the industry starting to recognise the valuable role enthusiasts have to play. Running days like this one attracting thousands, both young and old are the proof of that. Today I had the pleasure of attending the open day at Go Coach in Otford, near Sevenoaks in Kent, which coincided wth the Sevenoaks Vintage Bus Running Day. Shuttle bus services were in operation from both Sevenoaks Bus Station, and Go Coaches' depot, ferrying enthusiasts from one site to the other and providing a truly varied mix of vehicles catering for all tastes and memories. I was lucky enough to be an invted guest of Go Coach, and so based myself there for the day, and I traveled on no fewer than 2 completely unique buses in this country, one extremely rare (an old friend of ours) and a jumbo 100 seater Volvo B9 Olympus tri axle decker. Not to mention a Routemaster and an E200. A bit about Go Coach though. 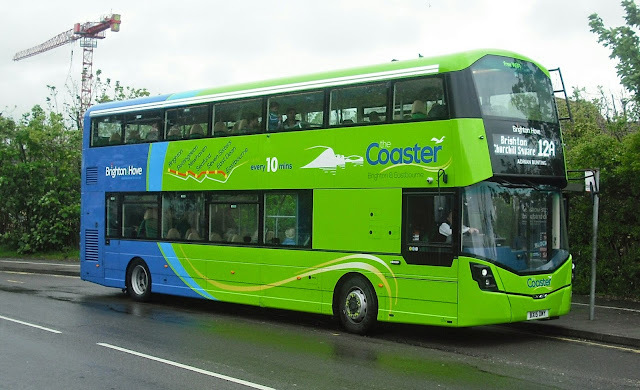 Based in Otford in West Kent they operate a fleet of 25 vehicles, mainly on school contract work, but do run a number of passenger services, most notably the 401 from Westerham to Sevenoaks, which extends to Tonbridge on Sundays. One of their school contracts serves schools in Orpington, and this is what the B9tl is used for. Completely spoiled kids down there! The obvious comparison is with the East Lancs Mylenium bodied B9's belonging to Sanders, and to be fair in comfort and ride quality they both score well. However the Olympus wins on leg room. It simply didn't feel cramped in there, and it really is wasted on kids! Part of the circuit via Sevenoaks the buses took included a stop in Otford Village at a place called The Pond (there is a roundabout with a pond in the mddle), which proved an extremely picturesque location for photos - a really nice touch and certainly appreciated by all those who scrambled on and off buses for their photo opportunities. At this point I would like to remind you of a pic I took in Colchester back in Feburary, of an E200 demonstrator on loan to Stephenson's operating on the 247. It appears that this little bus has had quite an eventful few months since I took that pic - in fact she has attended an event in Saudi Arabia, before coming back and going to Go Coach, who I believe are in the process of buying her for their 401 service. Certainly she has extremely comfortable leather seats, but all in all it's an E200, so the usual grumbles and moans apply! My next journey was on a Routemaster, but I'll save that till part two and move on to one of the more unique buses there today, and one most of you will be familiar with. 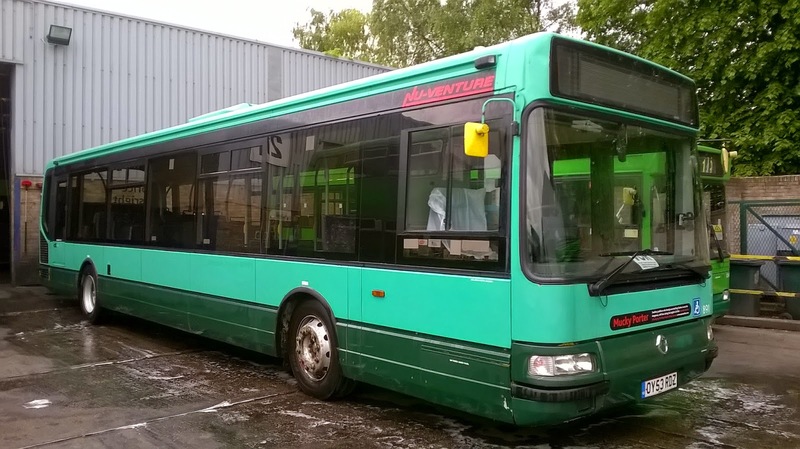 In Janurary when I last came to Kent I was lucky enough to visit Nu-Venture's depot in Aylesford and catch up with the 4 Irisbus Agoraline's bought from Norfolk Green. I was really pleased to see 898 at the open day today, and to catch up with Chris, her regular drver and caretaker! A brief update on two of the other three of the batch Nu-Venture bought - 891 has been off the road for the last six weeks awaiting a part which has had to be specially made. That part has arrived and 891 will be used as back up to 898. Only Chris drives them so at least one or the other will be on the road. Sadly though it's the end of the line for 895, which is currently being broken up prior to scrapping. It is the little touches that make you really appreciate that a vehicle is really cared for and dare I say it loved. The destination Chris put up for when the bus was resting says it all - a pleasure to see you again, Chris, and hope I'm riding on one of your babies again soon! There will be more of 898 in Part Two or Three! It was also a pleasure to meet Norman Kemp, Managing Director of Nu-Venture. Norman has had a varied career in the Kent bus industry, working at Boro'line and I believe Kentish Bus at Dartford before founding Nu-Venture. Finally for Part One a couple of other buses on show. First of all this Abelio E400 MMC was a static display, so sadly no journey on her, although I'm hoping to stop off in Croydon tomorrow to sample one in service, and to see if they are any better than the demonstrator I went on the other week. Lastly a bus that holds more memories for me than I can shake a stick at. I can clearly remember a specific journey on this Maidstone & District dual purpose Leyland Leopard in August 1983, where I was intending to go, who was driving it, and where I leapt off it early as I'd seen my (new) girlfriend polishing the knocker on her front door! So to see 2816, OKO 816G looking so good today brought all those memories flooding back. I didn't manage to get a ride on her but certainly hope to in the neae future. Maidstone & District Leyland Leopard 2816 in Sevenoaks. I'll try and post Part Two tomorrow, when we will go all Maltese and Chinese! Thanks to a three hour power cut ths post is late going up but it didn't inconvenience me anywhere near is it did Whincops nearby who not only had cars and vans stuck on ramps but a coach shut in the workshop behind electric doors! Anyway here we are and a lot to get through. Yesterday I stayed fairly local as I had a tv to repair in Wickham Market (my old one on permanent loan to an elderly gent before you think I've started a new business) and thanks to no service bus on a Wednesday and no space on the Suffolk Links bus the service bus was taken away to help out - more on that later - I found an alternative way of getting there which meant sampling a service I have rarely used - the 62 between Framlingham and Wickham Market operated by Paul Frost Travel of Woodbridge. Quite an ironic number bearing in mind the Anglian changes last week, and quite an unusual vehicle on the journey yesterday, a 25 seater Mercedes Sprinter minibus, that I found more spacious than a Solo, and certainly quieter. I have no idea what body is on it but the door area is huge and I'm quite surprised there aren't more of them around. Perhaps the fact it's fully manual plays a part. After successfully getting the tv back to life I had plenty of time on my hands so decided to catch the 64 to Aldeburgh for a spot of lunch, before catching what I knew would be a double decker back to Saxmundham. A perfectly adequate journey on Volvo B7rle 69005 got me to Aldeburgh After lunch I made my way to Fort Green and waited for the 64A and 65 to come in, as they meet there. I was pleasantly surprised when Excel fronted 69426 trundled in first, looking great in the Aldeburgh sun. Shortly after Volvo B7tl 32489 arrived and I have to say when she was parked up looked absolutely stunning and nothing like a 12yo vehicle at all. Of course the opportunity to get the two together couldn't be missed, despite the sun making the resulting pic a little hazy. I have to mention the driver of 32489 - by far and away the friendliest driver I have ever encountered at Ipswich depot. We had a completely spontaneous natter during his layover at Aldeburgh and the way he greeted all his passengers was a breath of fresh air. I was lucky enough to get on his bus again today and he proved yesterday was no coincidence. Great to meet you, Barry and I hope I have the pleasure of your driving many times in the future. Before I move on to today's news a bit of a rant. As mentioned earlier our service bus here was removed on Wednesdays and Saturdays to reduce demand on the Suffolk Links Loes bus. It doesn't seem to be working. Yesterday I couldn't book a morning journey and the afternoon journey home from Saxmundham was a mystery tour of Suffolk, going via Framlingham and Earl Soham, taking over an hour to get me home. Now I appreciate that I may be sounding a bit churlish, so I caught the service bus to Sax today, and asked the driver how the loadings on the new Wednesday and Saturday routes were going. He told me that since the new routes started on April 1st he has picked up precisely three passengers. Not 3 per journey or 3 per week but 3 in total. I would suggest to Suffolk County Council that the changes are not working so can we have our service bus back please Weds and Sats! Thank you! Now to today and Sanders have revealed a new addition to their fleet. Ex Manchester Airport VDL SB200 Wright Eclipse 2 YJ10 DJU has already been painted into Sanders livery, although still awaiting vinyls, and looks quite smart. What route(s) she will be allocated to remains to be seen. Sanders posted the following pics on Twitter earlier today. Finally today whereas some people use moles to dig up information I go a bit bigger and use badgers. This particular Badger is a driver for Konect on the 8's, and when he tweeted this morning that he had a Volvo decker instead of a usual E400 I asked him to take a pic. This he did, but Badger being Badger there was always going to be something different about the pic, and this is clearly Konect's attempt to recreate the Beatles Abbey Road album cover, except there's only one of them. A brilliant shot, Badger! It was a joy to wake up this morning to an email from Krayon Klein, who runs a bus blog in Brazil. He has asked me, as well as Andy's Bus Blog and East Norfolk Bus Blog to provide mutual links, and I hope photo exchanges. Wouldn't it be good if this was the start of a International Bus Blog Community. Anyway you can see Krayon's blog, which is entitled OneBus, by clicking here. One of the Brazilian monsters I published over Christmas.